The story for Bubblegum Princess was inspired by an incident which happened in 2006 at the Royal Military Academy Sandhurst’s passing out ceremony. This parade for graduating cadets included Prince Will. At the event, Kate Middleton behaved like a proper prospective princess, but her mum was caught on camera chewing gum. Soon afterwards, Kate and Will stopped dating. Tabloid journalists speculated that the queen strongly disapproved of Kate’s bourgeois family, and that she’d forbidden Prince Will from seeing Kate. It was all rather silly but I wondered, what if gum chewing was outlawed? And what if the queen banished anyone who dared to chew gum in her royal presence? It was a funny idea for a story. When I met illustrator Lori Hanson, we chatted about it and decided that together we could create a picture book based on this gum chewing incident. We loved picture books, but thought it might be a good idea to take a closer look at them. How many pages of story were there? On what page did the story begin? How many single illustrations and how many spreads were used? Layouts and illustration formats varied, but I found that there were typically 24 pages for front matter (the copyright page, title page/publishers page) and story text, and the stories usually began on page three or five. Using this outline, I revised the story several times. Then I sent the manuscript to editor Marlo Garnsworthy, whom I found through www.book-editing.com. I explained that I was playing with language to make the text musical, challenging, and fun to read out loud. Like almost all writers’ first attempts, it was not pretty. Sometimes, you have to get this horrible version out of your system and if you’re lucky, you find a talented editor up for the challenge of guiding you to your story. Fortunately, Marlo understood what I was going for and agreed to work with me on it. And she was right. Of course I didn’t have to remain tied to the original tabloid inspired plot point: “A Mum Chewing Gum Gets The Queen’s Goat!” And that was when writing this story became really fun! Next up: Story Development, Part 2: Our corgis can fly!! Julie Gribble was the first picture book author accepted into the Stony Brook Southampton Children’s Literature Fellows program and has been mentored by Emma Walton Hamilton and Cindy Kane Trumbore. She’s a full-time writer and a member of SCBWI, ChLA, and BAFTA. Lori Hanson received her Master of Fine Arts from the San Francisco Art Institute and served an apprenticeship under celebrated artist Gregory Gillespie. She’s a member of SCBWI. Bubblegum Princess, a picture book inspired by the Duke and Duchess of Cambridge, has received a First Place Royal Dragonfly Children’s Picture Book Award and a nomination for a Cybils Award. You can find Julie at the NY Media Works website. You can find Lori at her website. 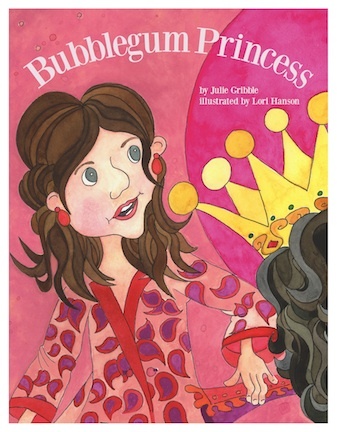 You can find Bubblegum Princess at her website or on Amazon. Julie welcomes your questions — if you have any questions about the independent publishing process, please leave them in the comments. Thank you! Love all the detailed sharing and a 13 page crit on a picture book is worth so much! Enjoy Montreal! Thanks for this, Beth and Julie. It’s always good to get the ‘inside story’! You’re welcome, Jarm! I will share my missteps as well so that your journey might be a bit easier. I love the storyboard. Simple. Visual. Something to try tomorrow! Marlo’s critique was laser focused. I will share some of the more embarrassing first paragraphs I wrote along with her suggestions – you will LOVE what Marlo had to say! Loving the inside scoop on Bubble Gum Princess! 13 page critique… what an indepth job. Can’t wait to read the rest of your journey! Ladies, thank you for this post. Thinking critically about my work is a true process. I am so glad I read this post. I am loving this. I CAN’T WAIT TO HAVE YOU SHARE WHAT MARLO DID TO HELP YOUR STORY. You will love Marlo’s critique! Thank you Erik! I am so honored to have YOU as a fan! 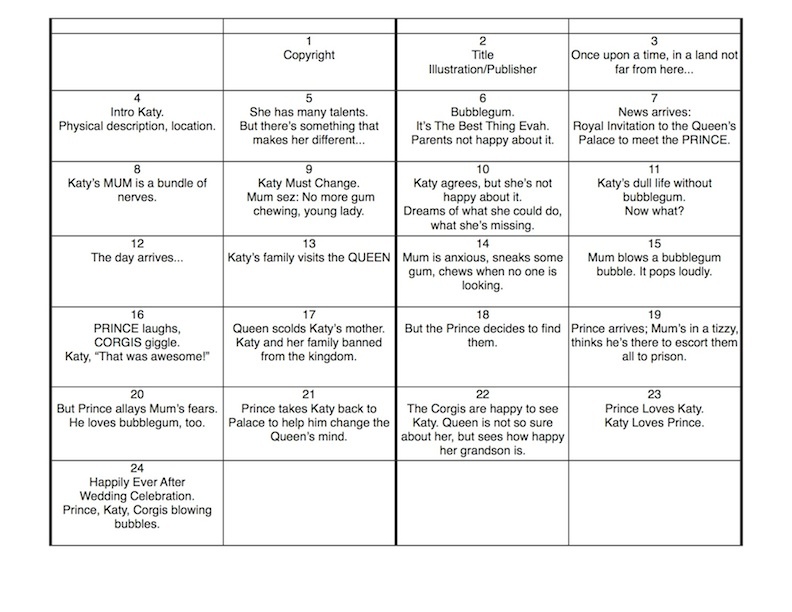 I always love reading about how people come up with their ideas and also love seeing the template outline of how they work out their PB stories. Thanks for another fascinating segment into the making of Bubblegum Princess, Beth and Julie! I have a folder filled with inspiring images and articles that I’ve come across over the years. It’s a great way to keep track of possible story ideas. Very interesting post. Thanks for sharing the process, Julie. Looking forward to reading the critique.